Today’s giveaway is brought to you by Pam of Natural n Healthy, a representative of Shaklee. At Shaklee they believe cleaning house shouldn’t involve dirtying the earth. Get Clean™ products use biodegradable cleaning agents, which means they break down easily instead of hanging out in the ground for hundreds of years. They also have no phosphates, borates, nitrates, or other stuff the planet doesn’t appreciate. And by making them superconcentrated, we leave you to add water so we can subtract waste. This has tons of implications. Literally. Less weight to ship. Less product to use. Less packaging to throw away. So you can get that clean feeling about your house, knowing you’re keeping the planet clean, too. An unbelievable 48 gallons of super-safe, really powerful, double-concentrated clean come out of this one little16-ounce bottle. Can be mixed into about 214 28oz bottles of ready-to-use all-purpose cleaner. Can also be mixed as a Glass and Window cleaner and a Degreaser. Included are 3 Get Clean handy spray bottles! 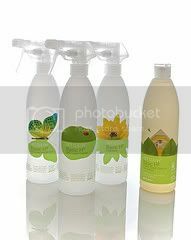 Each bottle is labeled with instructions for mixing Basic H2 for All Purpose Cleaning (leaf), Glass Cleaning (butterfly), and Degreasing (flower). Bottles have ounce measurements along the side and ‘Get Clean beliefs’ around the bottom. Please leave a separate comment for each entry. Entries that do not follow the guidelines above will be deleted. If you are reading this post in your e-mail or feed click here to comment. Crunchy Domestic Goddess! Come on Down! I go for the organic and natural way of cleaning! A Winner was already picked for this giveaway. Please see admin comment above. Please come back for our new giveaway Monday morning. Thanks! I tried a tested of the H2 once, it was great. ooo i’d love to try the whole starter kit…looks like it contains all the things needed for all my cleaning needs! alright guess well never get to 100 so comments closed! Going to pick a winner! LaMamaNaturale´s last blog post..Earth Friendly Halloween Tips= Hallowgreen! Actually already a Shaklee member, and love this stuff…all of it! LaMamaNaturale is right, that scour paste is the best for tubs! Great giveaway! I’d like to try the Shaklee Heavy Duty Scour Paste- with a new tub going in this stuff will be awesome! I love the dryer sheets. They work great! I so would love to try this. I love the products are safe, healthy and green and the bottles are so cute. Really cool product! Amazing what the free market is coming up with these days! I wonder if I can come up with enough talking points to fill up 82 more comments? I so love green cleaning stuff. This looks like a product i would love to have around! I’d be interested in trying the automatic dishwash concentrate! Going to get the word out about the great Shaklee cleaning products. I really love the idea og the Basic H2 wipes! Healthy, safe, and gets the job done. I’m so excited to have the RSS feed on my desktop! I started using the Basic H shortly after I had my first child. Knowing that my son would not be exposed to the chemical smell, and toxins found in other cleaners made me a very happy mama. Now that he is older, I feel safe in knowing that he can help me with the household cleaning, and I don’t have to worry about him accidentally poisoning himself. And, of course, I blogged the giveaway as well. Yea, internet! I also tweeted the giveaway. 🙂 Thanks to Amy, the crunchy domestic goddess, for turning me on to this site! I’d love to try the dishwasher concentrate. I haven’t an environmentally-sound found one I like yet, and hate using Cascade. I would be interested in those wipes too. With 5 cats, a dog and two young children, they’d be a life-saver. Better still, if I could, I would like the whole starter kit, I don’t know much about this company & products, but know it’s been around as long as I have(shhh). I would love to try the all purpose cleaner, since I’m constantly wiping down surfaces all day. We have cats,. I like the fresh laundry liquid best, I am always looking for more environmentally friendly cleaning products for our clothes! changing the world”. Wow…that’s powerful!